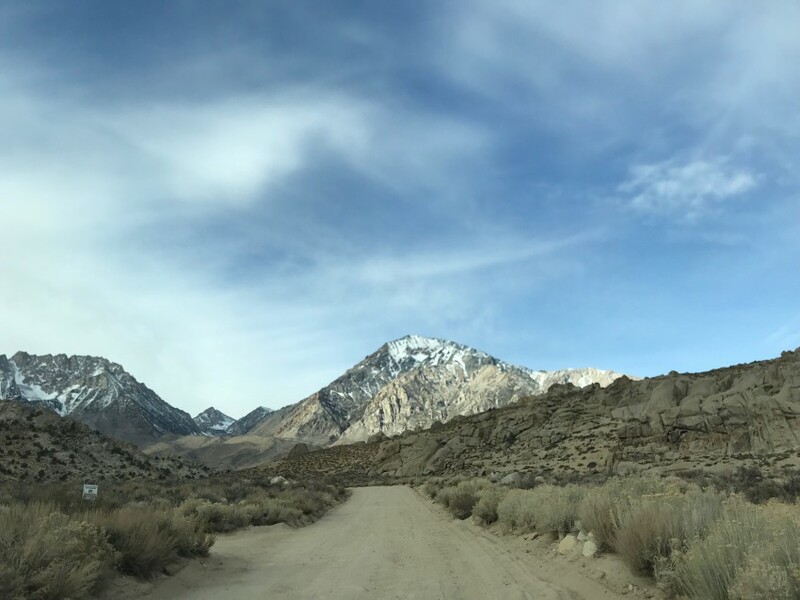 Last winter, Scott and I travelled to Bishop, California for the first time, and ever since then, we have been wanting to go back. 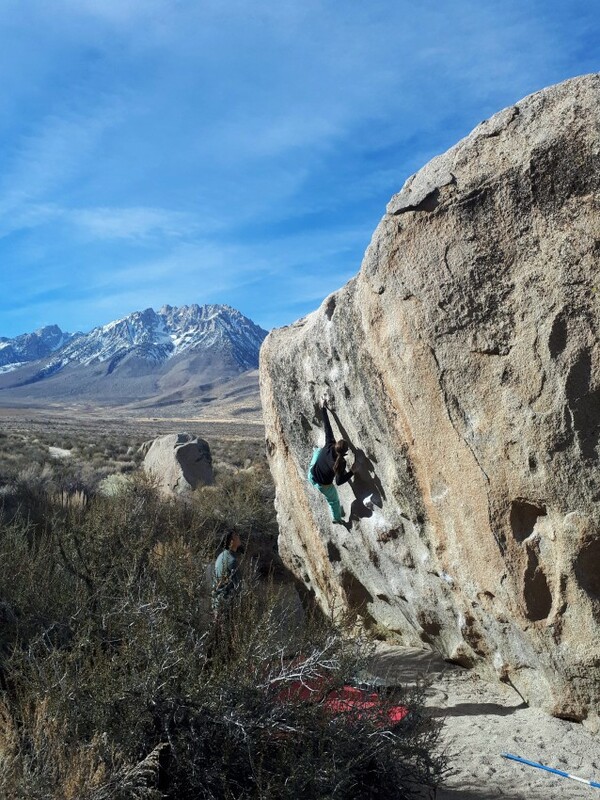 We had only gotten a taste of how amazing the climbing is in Bishop and were left with some unfinished projects. So,for this winter break, we planned a trip and squeezed in as many days as we could. We ended up leaving a few days before Christmas, which gave us 17 days total, including 2 days of driving each way. 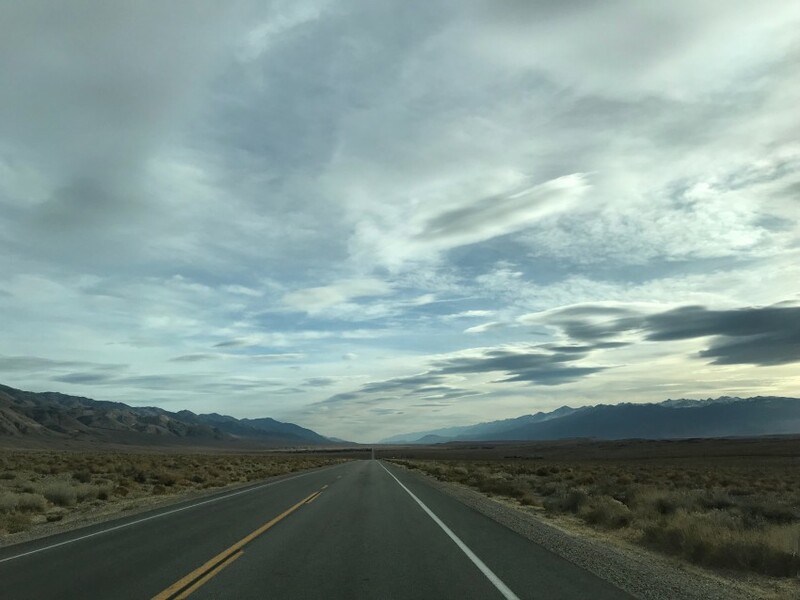 The drive to Bishop is very long, so to make it worthwhile you need to go for a couple weeks. Also, our friend Matt Hendsbee, from Edmonton, flew down after Christmas to join us. He had never been to Bishop before and was psyched to try anything and everything. On our second day of driving, we finally arrived in Bishop, went to the grocery store, and found the perfect site to set up camp at the Pit Campground. Since it was so cold last year, we had debated finding a house to stay in, but we couldn’t pass up the $5 per site per day fee, especially since we would be splitting it three ways. We brought so many blankets for sleeping because last year we had frost in the mornings, but it turned out much warmer than we expected. We had the most perfect weather you could ask for on a climbing trip. We could climb in t-shirts and had to plan our day so we could avoid climbing boulders in the sun because it was too hot. Our first day climbing we went to the Buttermilks. Last trip we didn’t get to spend very many days there due to snow, so this year it was our main climbing area. The problems I wanted to try were all in the Buttermilks and Scott’s main goal for the trip was to do The Mandala. No matter how many times you drive up Buttermilk Road it’s breathtaking how big the Peabody boulders are when you come around the last corner before arriving at the boulder field. We had an easier first day to let our skin adjust to the sharp crimps of the boulders. 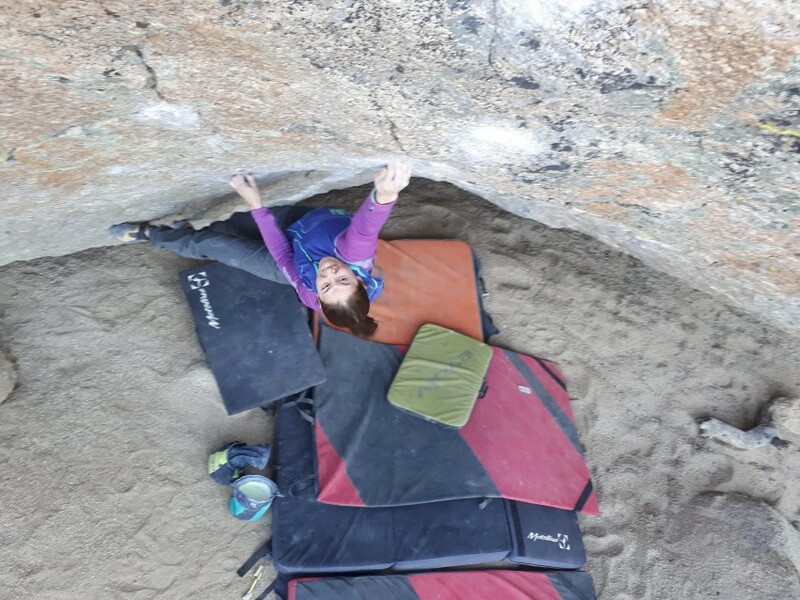 We warmed up at the classic Green Wall and headed over to High Plains Drifter, one of the classic highballs we never tried last trip. 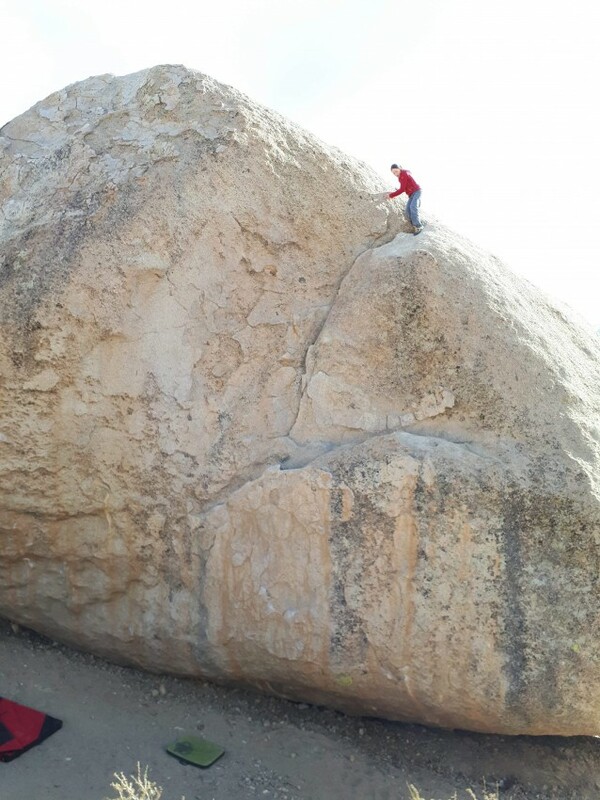 Normally this problem is crowded with people, but when we got there we had the boulder to ourselves. After looking at the problem and trying to figure out a good sequence, Scott made it look really easy and flashed it. 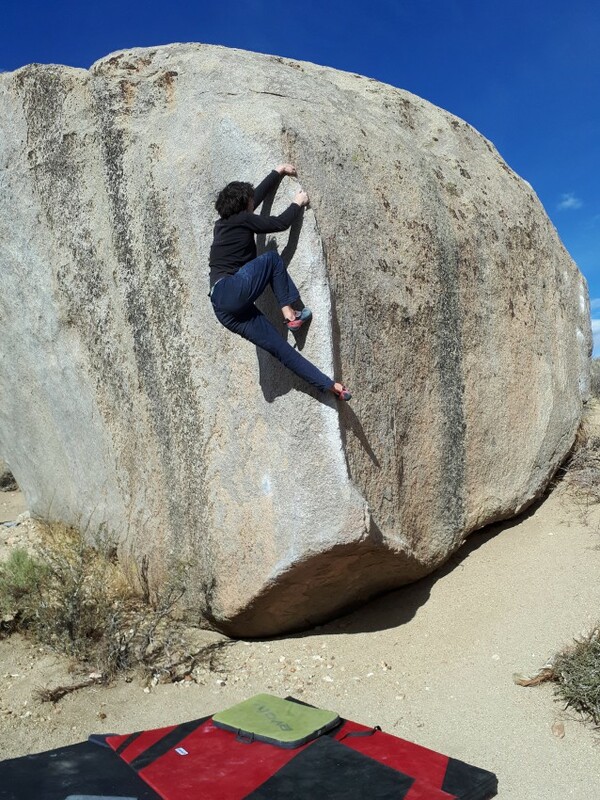 I’m not a fan of climbing tall boulders, but I gave this one a try because the hard moves are close to the beginning and the holds for the top-out are jugs. After a few tries and beta changes, I stuck the last hard move but still had one more big lock-off to a jug. I needed extra encouragement and convincing from Scott to get my foot up and reach for it, which wasn’t as bad as I thought, and I made it to the top. Just up the hill from High Plains Drifter is Popes Prow, a tall arête that looks like it would be fun to climb. It’s on the same boulder as Scott’s project, so we figured it would be a good intermediate warm-up to try before he tried The Mandala. It’s a very technical climb and any wrong body position will make you barn door straight off the arête. After many failed attempts by the both of us on the start move, Scott managed to make his way to the top, but not without beach whaling and scaring me as I spotted him. Scott had been wanting to get back on The Mandala since we left Bishop last year. 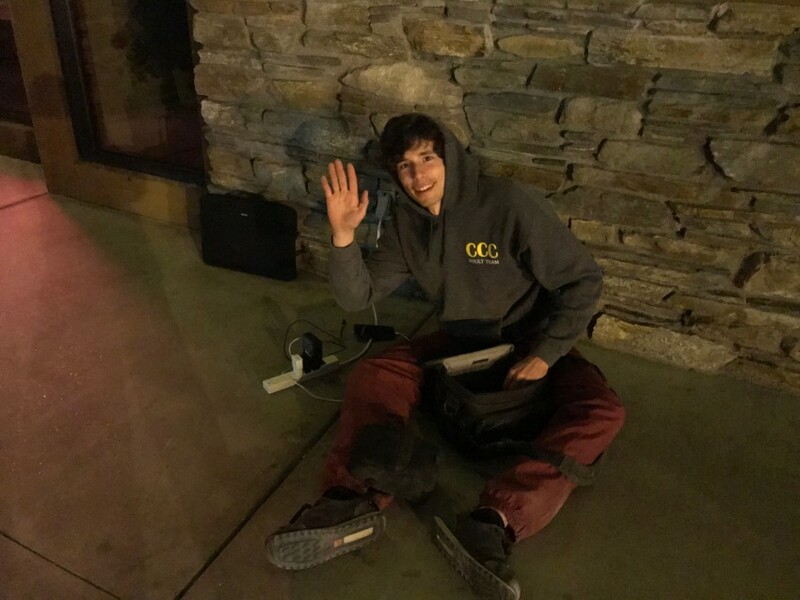 He was only able to try it for one day in the snow so it was his main goal for this trip. He reacquainted himself with the sharp crimps and figured out the beta he wanted to use. 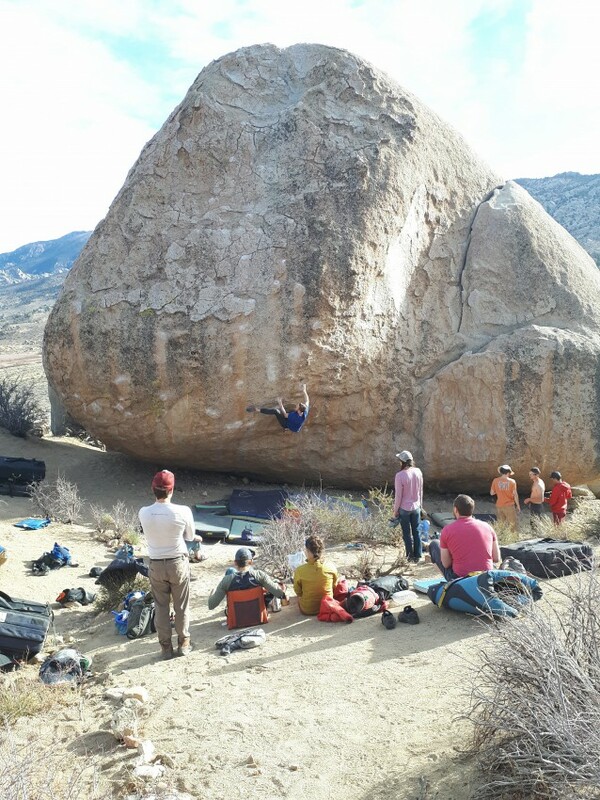 Our CCC teammate Adam was also psyched to try The Mandala so we had a couple sessions on it with him. Scott got his highpoint early in the trip and was so close to sending it. He would try it after every rest day when his skin was its best. Unfortunately, he fell and sprained his ankle after New Years and wasn’t able to try it for the rest of the trip. But he will definitely be back to send it. 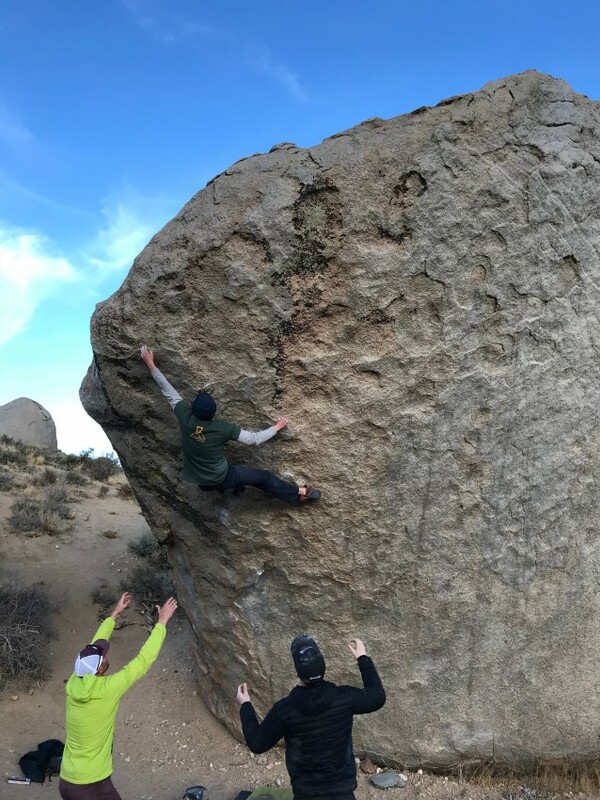 On Christmas Day, we met up with our teammates Adam and Michelle at the Get Carter boulder to try Seven Spanish Angels. 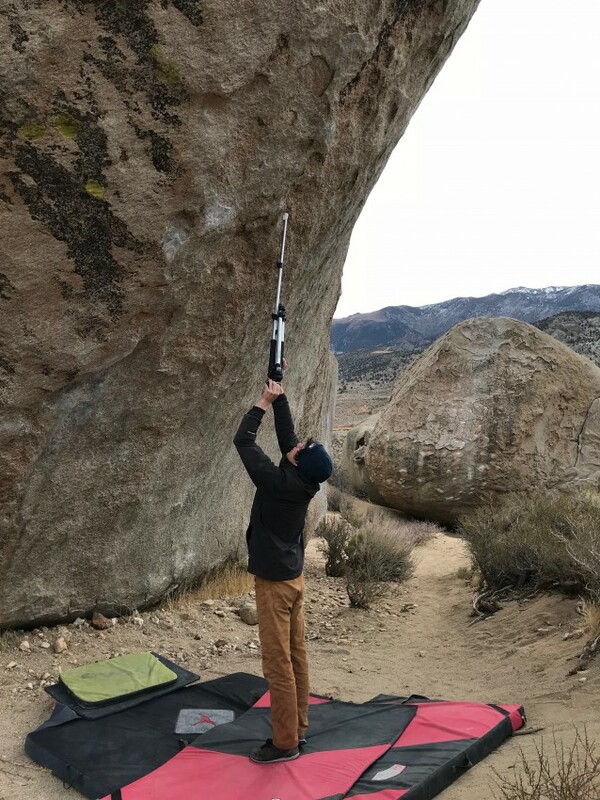 I wanted to try this problem last trip but we never got around to it. It’s on a very featured wall with lots of slopers and a committing jump to the finish hold. Scott and I warmed up and then watched Michelle send the boulder with ease. She used a small crimp to avoid the jump, which I tried to use my first few attempts but it was so small I ended up doing the jump to send it. After, we headed over to Soul Slinger, which was one of the climbs I wanted to complete this year. I got to try it once last year but then it snowed and I never got another chance. I familiarized myself with the holds and tried to remember my beta from last time. 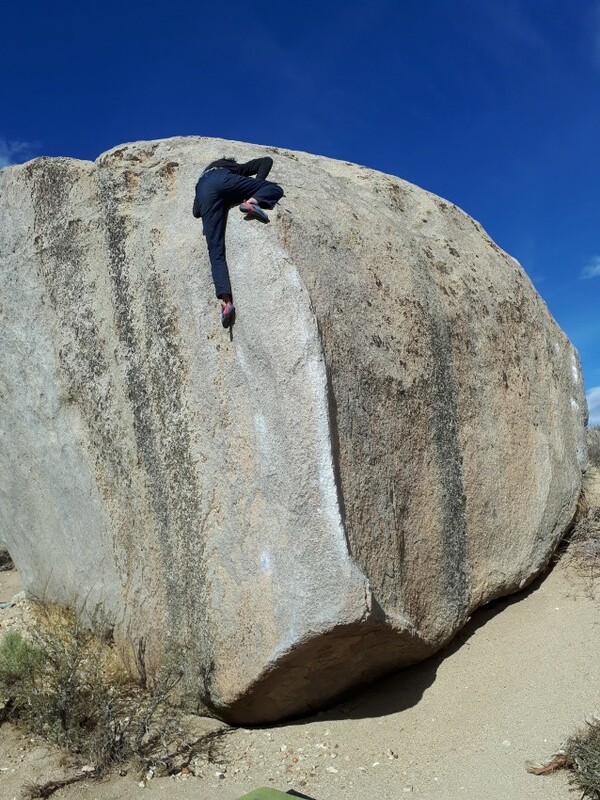 After only a few tries I got past the hardest move, which I never stuck last year, and lurched for the bucket and pulled myself on top of the boulder. Here is a link to the video of my send of Soul Slinger (https://youtu.be/w8IN6zR23BA). 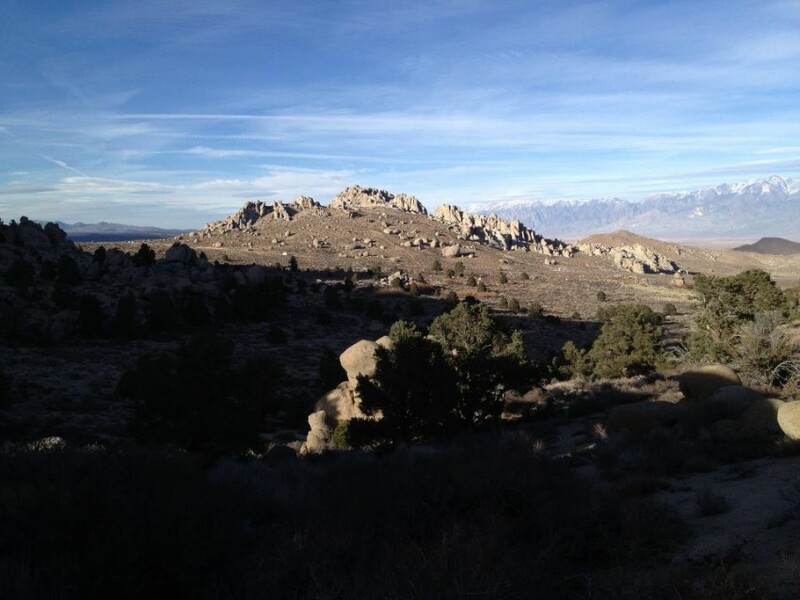 Since we had only been going to The Buttermilks, we decided to spend a day in the Happy Boulders. We got Matt to try some of the classic lines, like The Hulk and Acid Wash, which he quickly sent. I didn’t have any specific climbs I wanted to try in the Happies but I redid a few classics and sent a new V8 called Disco Diva. Scott wanted to try Kill On Sight, a V11 he tried last year. Both Scott and Matt started off trying the stand version, called Standing Kill Order. I originally wasn’t going to try it because it looked like one of the moves was very height dependent, but they were making it look really fun so decided to put on my shoes and give it a go. It has a cool toe hook move at the start and then you make a far reach a crimp undercling in a roof. It took me a couple tries to set the toe hook properly but on my fourth try I surprised myself and stuck the undercling and sent the boulder. We were all shocked when I sent it so quickly. I decided I would try the sit because it only adds in a few more moves. It’s quite a tiring boulder to project though, because it requires a lot of core to get the toe hook right and keep the tension when you hit the undercling. I wasn’t able to stick the hard move again that session or the next time we went to the Happies. 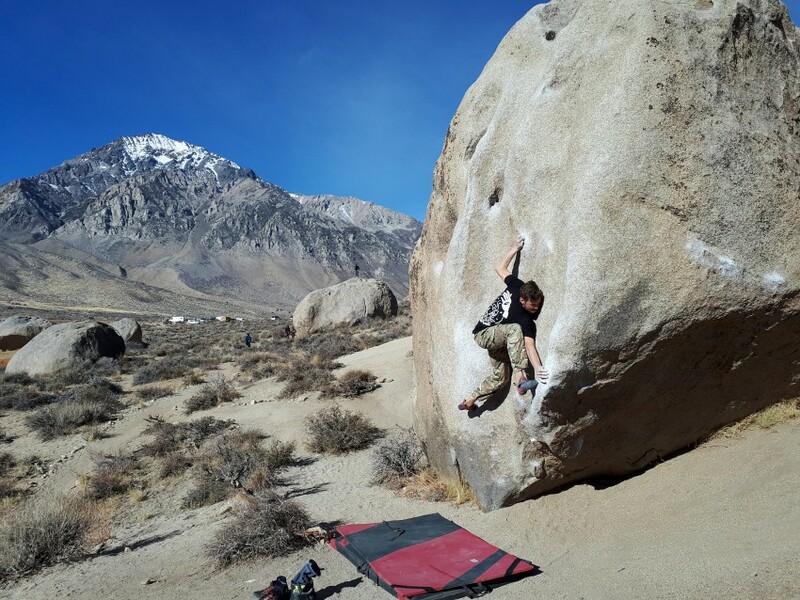 A few days later we went back to the Happy Boulders again, where both Matt and I sent Kill On Sight. The key for me was getting the toe hook higher than I thought it needed to be, which gave me a little bit extra reach for the undercling and it felt much easier than my previous attempts. Here is a link to a video of my send of Kill On Sight (https://youtu.be/niaCBqldET8). The other problem I wanted to try this trip was Xavier’s Roof. It’s across the road from the main Buttermilks area and a bit of a hike. 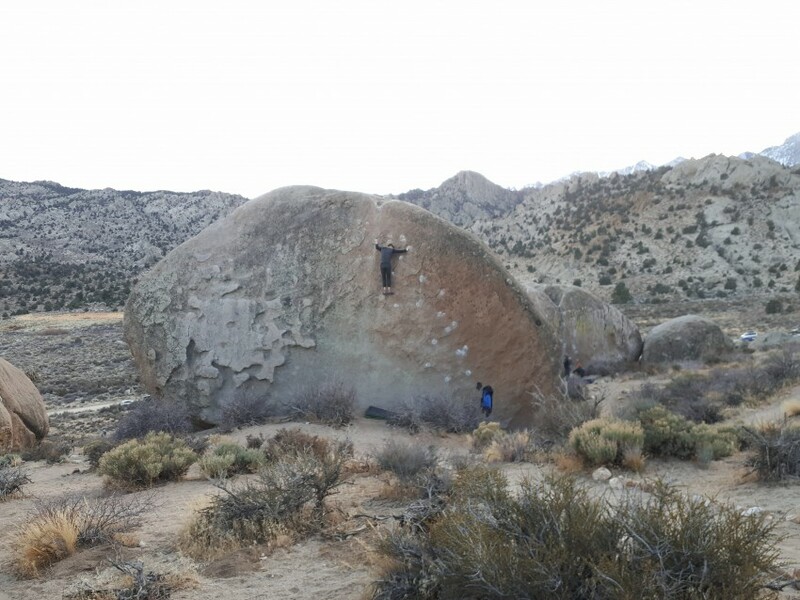 When we got to the boulder, there were some people trying it already, and after we gave it a couple goes another crew of people showed up. It was nice to have lots of people because we could stack a couple extra pads and try the problem from the middle of the roof. Scott got really close to sending it, falling on the last move from the ground. I was trying a different beta for the reachy finish but I’ll need to return with more tiny crimp tolerance. We tried some other really hard problems as well, like Evilution and A Maze of Death. A Maze of Death is quite cool because it is on a perfectly curved boulder with cracks and crimps all along it. 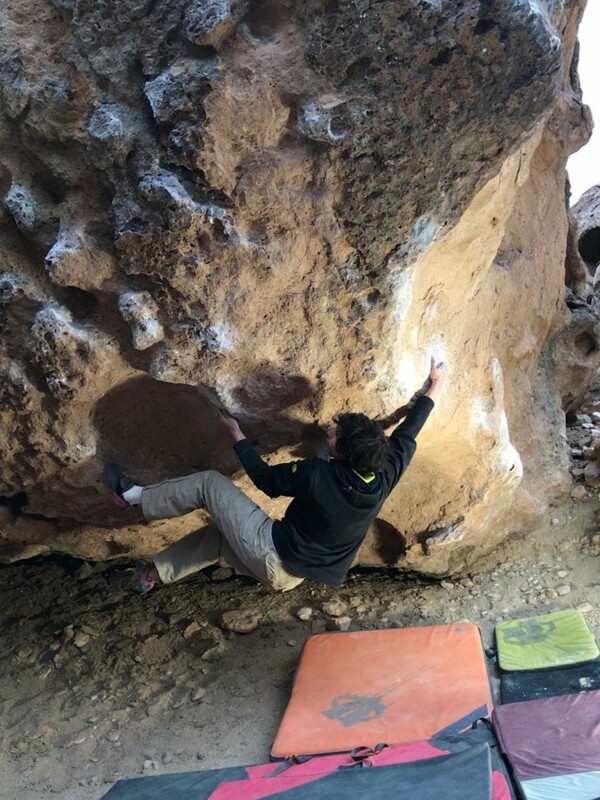 It was fun to work but it’s definitely a boulder to come back to with a stronger core and stronger fingers. Camping on road trips is much more interesting than staying in a hotel or renting a house. You can get creative with making meals that are still easy and simple, but fancier than the typical just-add-water packages. We made some pretty gourmet meals, like French toast, butter chicken, Thai peanut stir-fry, and chicken alfredo pasta. We even added in habanero peppers to spice it up a bit. One evening after we finished eating dinner, Scott and Matt decided to make a bet. 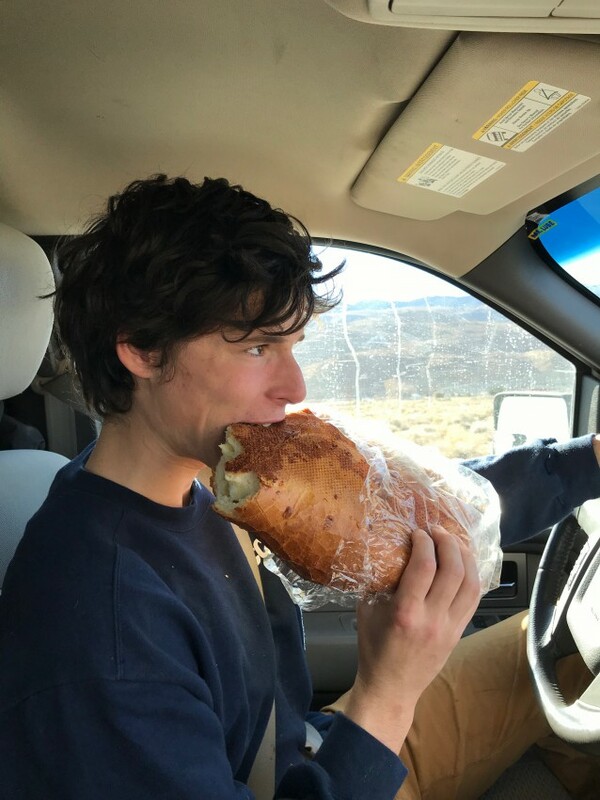 Matt was going to buy Scott his own cheese bread from Schat’s Bakery if he could eat a whole habanero pepper in one go, seeds and all. We had only been putting about a third of the pepper into a whole pot of food, and sometimes it was almost too spicy for me. Scott managed to bargain with Matt to add in fresh churros from the bakery to the deal and he popped the pepper into his mouth. Long story short, Scott got his cheese bread and churros, but also got to see one of our fancy meals and the habanero pepper for the second time that night. Our last few days we tried to finish up our projects. 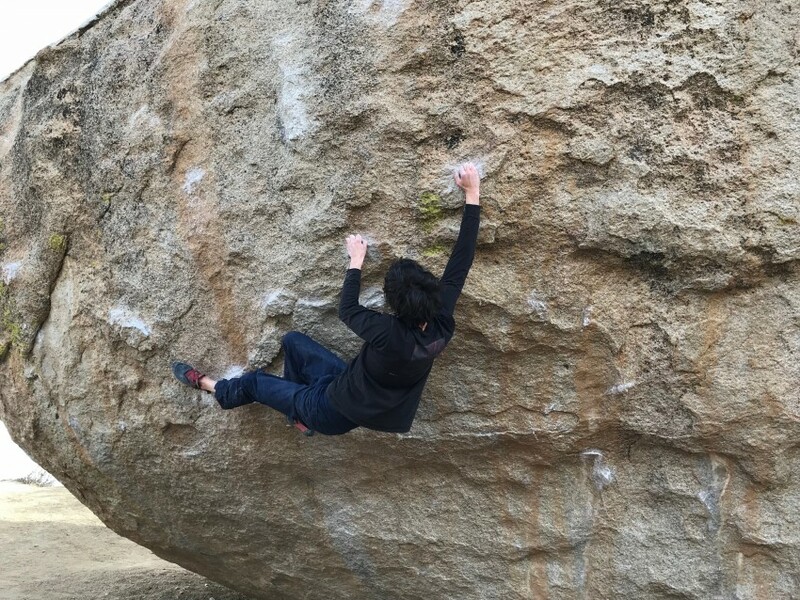 Matt was working on Soul Slinger earlier in the trip and even had a session on it with Alex Honnold and Will Stanhope. One evening Matt was painfully close to sending it but he was too exhausted. We went back to the Buttermilks the next day, which was also our last day climbing, and Matt impressed the other climbers trying Soul Slinger by sending it first try of the day and making it look easy. 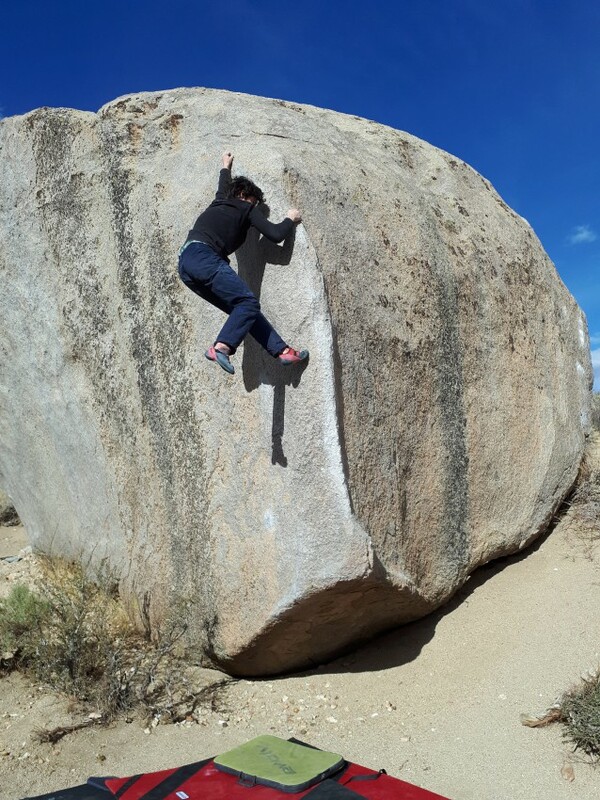 I tried the sharp and crimpy Junior’s Achievement as my last boulder of the trip. 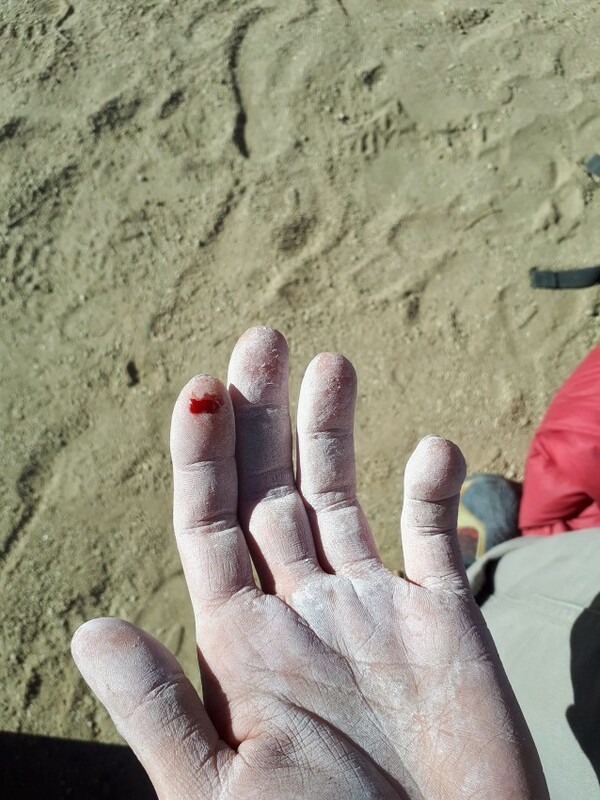 Good thing it was my last attempt and last climb because I ended up cutting my finger on my send go. Overall it was an incredible trip with amazing people. I can’t wait to take another road trip back someday.